Declassified UK intelligence documents reveal details of the violent uprising that saw Dom Mintoff flee Gozo in 1962. Documents published in a new book detail how Gozitans took up positions at 7am while women armed with broomsticks surrounded the approaches to Lourdes church in Mġarr harbour in a concerted effort to derail plans by Mintoff to hold an infamous meeting in Gozo in 1961. “The date for the meeting… was set for Sunday, May 21, but it was more than clear that the opposition to Mintoff in Gozo was enormous. It was quite evident that the Gozitans were not going to stand for any nonsense and they did not,” the 1961 report on Labour Party activities reads. Stone wielding farmers saw Dom Mintoff and an army of 900 “thuggish Mintoffians” scurry back from Gozo “with their tails between their legs”, the book recounts, after they abandoned a planned meeting at it-Tokk square in Victoria following the incessant ringing of church bells which drowned out the speakers. The report on the Gozo incidents, rather ironically entitled Eddie’s day in Gozo, forms part of an extensive UK intelligence dossier on tensions between the Church and Mr Mintoff’s Labour Party in the run-up to the 1962 general election and provides “a true Gozitan slant on the epic events” that occurred that day. The documents form part of a new book on Maltese independence written by historian Mark Camilleri called Il-Ħelsien: Il-Mixja lejn it 31 ta’ Marzu tal-1979. The meeting was organised by the then Labour leader to “stir up a boycott of the civic council elections in Gozo”, a move many Gozitans resented, the British author writes.“They were furious that he was interfering in their affairs and did not take it lying down,” the report reads. The Labour Party media had been printing articles in both Ħelsien and Voice of Malta, Labour affiliated newspapers, claiming the Gozitans wanted to host the Labour leader for several weeks prior to the ill-fated meeting. One article dated a week before the event reads: “In their own words they say we want our beloved leader to come to Gozo to show him our love for him”. British intelligence, however, pointed to a different reality. The unnamed officer who drafted the report spent a week in Gozo, “gauging the Gozitan public sentiment” prior to the event. This, the officer writes, was growing in “anti-Mintoff tension”. 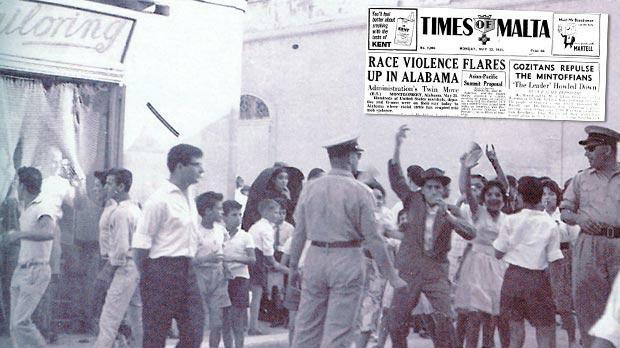 The report says “although the Malta Labour Party press had been referring to the Gozitans as ‘their beloved brethren’” at the same time “the teddy boys on Kingsway (Valletta, later renamed Republic Street)”, a 1950s delinquent sub-culture, were saying “let’s all go to Gozo on Sunday and beat up the Gozitans”. This, the author writes, was no secret to the Gozitans who were also preparing for a fight. It transpires that a group of around 30 ‘teddy boy’ Labour Party supporters had headed to Gozo the day before the meeting to provide a bodyguard for Mr Mintoff. 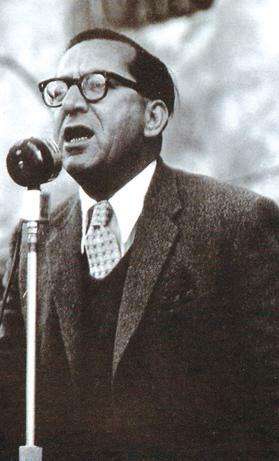 Gozitans took to the streets to derail plans by Dom Mintoff to hold a meeting at in Gozo in 1961. Inset, how Times of Malta reported it. The group, however, was violently attacked while trying to disrupt a demonstration supporting Gozo Bishop Joseph Pace. “Fights ensued and they [Labour Party supporters] had to take refuge behind locked doors in their hotels, these ardent supporters returned to Malta by the first boat on Sunday morning quite frightened and badly shaken,” the report reads. The meeting the next day was cut short, or as one Gozitan at the time put it “never even happened”, after thousands of locals organised themselves into smaller groups and staged a series of road blocks, pelting Labour Party supporters with stones to and from the Mġarr harbour. The author describes in detail the “regimental” organisation of the Gozitans, who were opposed to the mass meeting being held. The report says they were to be in position by 7am on Sunday morning and remain in those positions until the Labour Party departed. “Distribution of biscuits took place at 11.30am,” it adds. Road blocks were held along Racecourse Street by people from Xagħra, Nadur, Qala, Xewkija and “a sprinkling of persons living in the street”. Other blockades were also set up along Market Street, St Joseph Street and Michael Refalo Street while Castle Hill was “filled by the female sections of Religious Organisations”. Instructions had been given for all the church bells in Victoria to start ringing whenever someone spoke at the meeting and a series of secret signals had been established as had a roster of bell ringers. 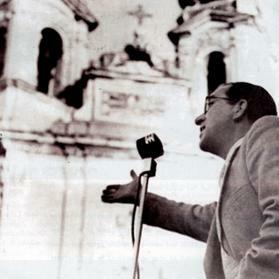 According to Times of Malta, Mr Mintoff “was seen to be speaking but could not be heard” as the bells of St James’s church, opposite the Banca Giuratale, rang out. Dom Mintoff’s speech was interrupted by church bells. “(Anton) Buttigieg, accompanied by Patrick Holland, was seen to approach Police Commissioner Vivian de Gray and made unmistakeable signs for that the bells of St James’s church should be stopped. “A police officer and young priest entered the church and the bells stopped ringing – but it was only for a few minutes. They started again with more urgency as soon as the first speaker started his address.” In the meantime, the Bishop of Gozo was cheered as he returned to the curia from the Cathedral and a decision was taken to end the meeting, Times of Malta reported. The report states that the majority of the hecklers consisted of “young men and women and men of fragile statue”. Behind, however, stood the men “all set to go into the fight should the hecklers be touched”. On the roofs of house piles of stones had been prepared but most were not used. The report describes the behaviour of the Labour Party supporters as abominable, and claims this is what led to the ensuing violence. “They swore at the Gozitans, called them fools, and burnt some of their crops on their way up and down from Rabat. “It was for this reason that the road blocks were erected and it was for this reason too, that they were pelted with stones all the way down to Mġarr. “Youths ran from Għajnsielem and threw rocks at the landing pier and women carrying broomsticks surrounded the approaches to Lourdes Church,” the report reads, adding that the police dealt with the Gozitans “very harshly” in response. The buses refused to carry the Mintoff supporters and shops would not provide food or drink, not even to the injured, the report adds. • Mr Camilleri will be giving a public lecture on his book on Friday at the Labour Party Headquarters in Ħamrun at 6.30pm.